In our survey of teachers about to teach the new primary history curriculum later this year one of the main things respondents wanted information on was the prehistoric remains local to their school. A fuller account of how to do this is given in one of our information booklets, How to research your local prehistory, but here are a couple of tips. The main way is to contact your local Historic Environment Record (HER). It is now statutory that all local authorities maintain a HER, so search on your local county or unitary authority website for archaeology or historic environment. A small number of authorities have outsourced the function to an external consultant, but it should still be accessible. Some, but not many, HERs have online databases. One, that Schools Prehistory’s Kim Biddulph worked on many years ago, is Buckinghamshire County Council’s HER at https://ubp.buckscc.gov.uk/SimpleSearch.aspx. Here you can search by parish, period, type of site or find (object) or simply by using a keyword. Most HERs have a similar database not fully accessible online, so it will just be a case of contacting the Historic Environment Record Officer (yes, that acronym makes HERO!) and giving them the post-code of your school and an idea of what period you’re looking at. Start with the whole of prehistory and then narrow it down if you get loads of results. The HER also holds reports of any archaeological investigation undertaken at each site, possibly photographs, and can plot the sites on a map for you so you can find them easily. This is a publicly accessible record so it’s there for you to use. As you’d be accessing it for educational non-commercial purposes, the service should also be provided free, or at least very cheaply. We undertook a search for Low Ash Primary School in Shipley and found some Bronze Age cairns (stone burial mounds), Iron Age settlement enclosures and, excitingly, some Bronze Age rock art easily accessible in their local park. We put together some notes for the teachers with teaching suggestions, a map of where everything was and a package of images to use on the whiteboard. A selection of what’s in the local HERs is on the National Monument Record held by English Heritage. Their website Pastscape has a searchable database, so you need to know your local authority area again and search for prehistory. If you don’t have time to do all this research, we’re happy to do it for you. Group together in your local cluster of schools and get us to find the exciting prehistoric remains local to you that will bring prehistory alive for your pupils. 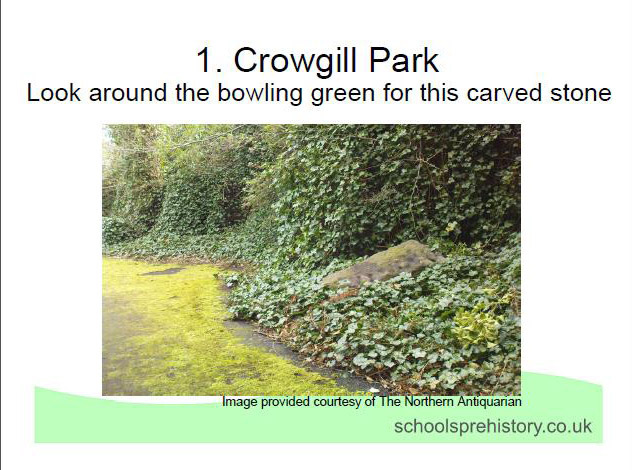 This entry was posted in Teaching resources and tagged historic environment record, local prehistory by Kim Biddulph. Bookmark the permalink. Thanks for that, Andy. That’s hugely useful for teachers!